A Spaceframe Chassis is an assortment of interlocking struts and braces arranged in triangular or pyramid like patterns to make a complete frame. A spaceframe usually distributes its weight evenly in all directions and is strong but lightweight compared to a similar sized self supporting structure which improves performance in a vehicle. Spaceframes have been used in the construction industry but the technology have been used in the automotive industry as car chassis as early as the 1930's. The spaceframe chassis is similar to a unibody or monocoque chassis in that it functions as the body and the frame simultaneously. The engine, drivetrain, suspension, fuel tank and body panels are attached to the spaceframe. 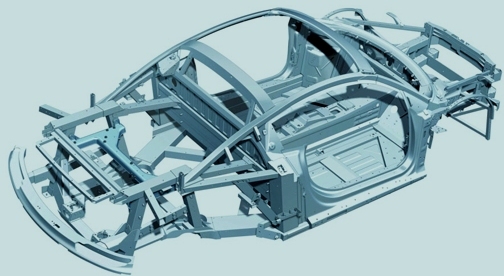 A car chassis can be part spaceframe and part unibody, in this configuration the passenger compartment is usually the unibody and the front and rear uses a spaceframe. Because of the shape of a car the spaceframe that's used in automobiles doesn't have the uniformed look as the ones used in the construction industry. Sometimes it's hard to see any resemblance but the structural similarities are there. Whenever you see an image or a replica of a spaceframe that's used in a car produced for the mass market such as the Audi A8 you may find it difficult to tell it apart from a unibody. The spaceframe chassis on a motorcycle or an aftermarket built racecar while still not uniformed usually bears closer resemblence to their construction counterparts. Various lengths, thicknesses, strengths and alloys and/or materials can be and are usually used when building a car's spaceframe as various parts of a chassis perform different functions. With that being said it's relatively easy to incorporate features such as crumple zones and a rigid passenger safety cell into the vehicle. Audi is the automotive industry leader in the use of spaceframes with over 500,000 vehicles sold in the marque's history. The A8 and R8 use spaceframe technology in their chassis which Audi calls the Audi Space Frame (ASF). R8 shown in image. Other vehicles that use a spaceframe chassis (or part of) are the Mercedes Benz SLS AMG, Lamborghini Gallardo and the Rolls Royce Phantom.